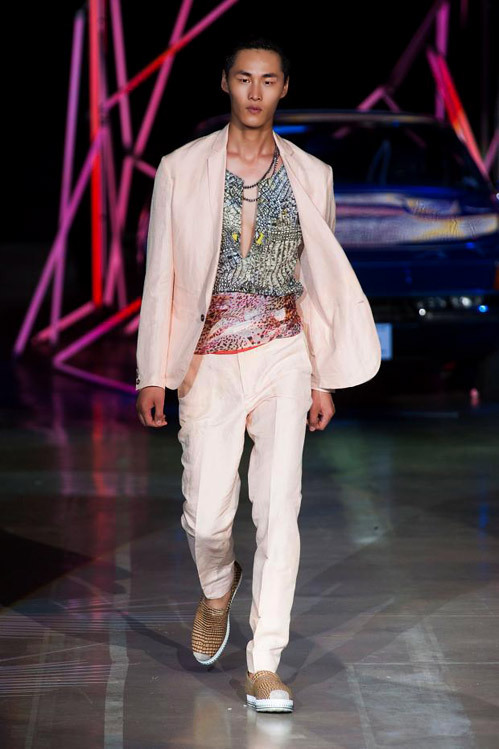 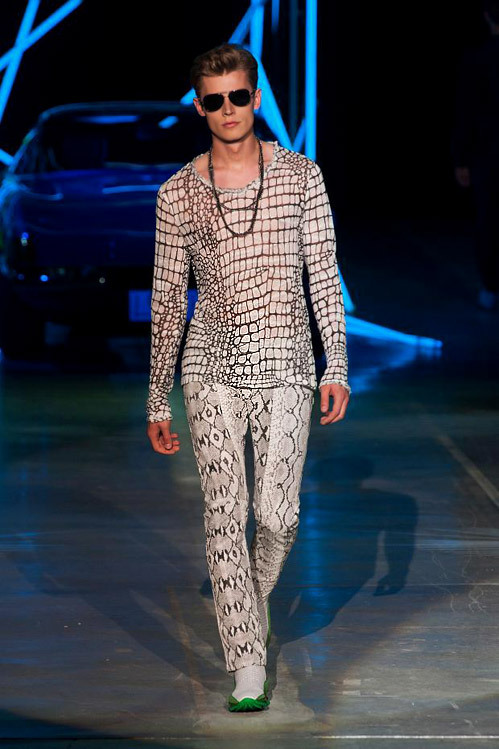 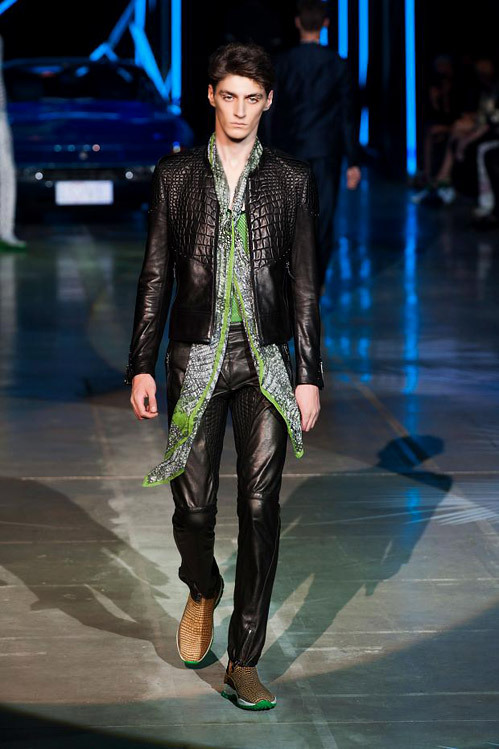 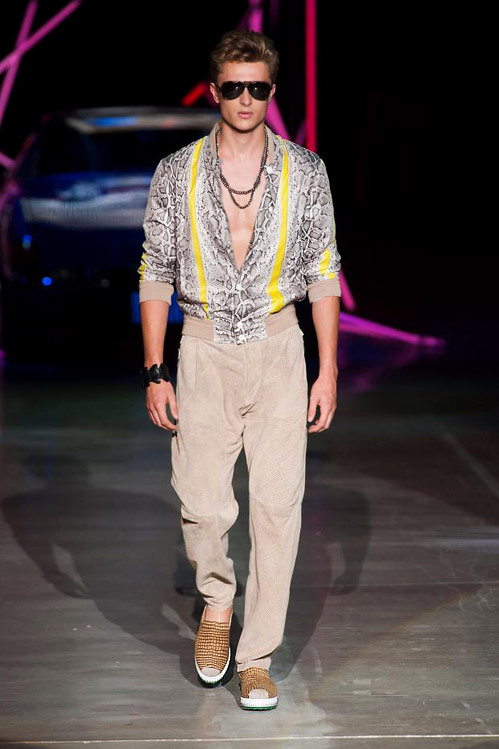 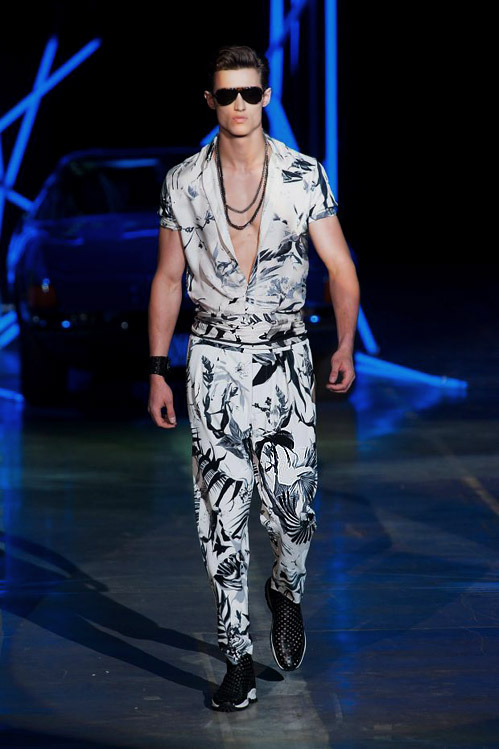 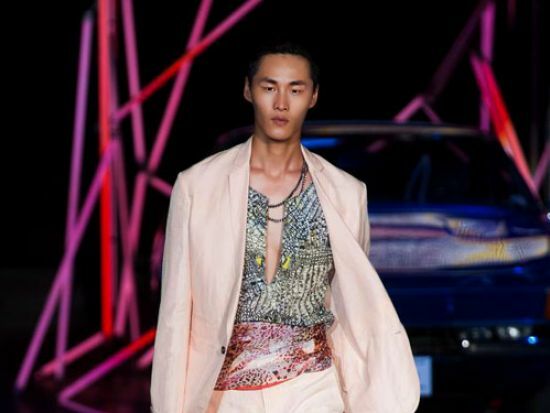 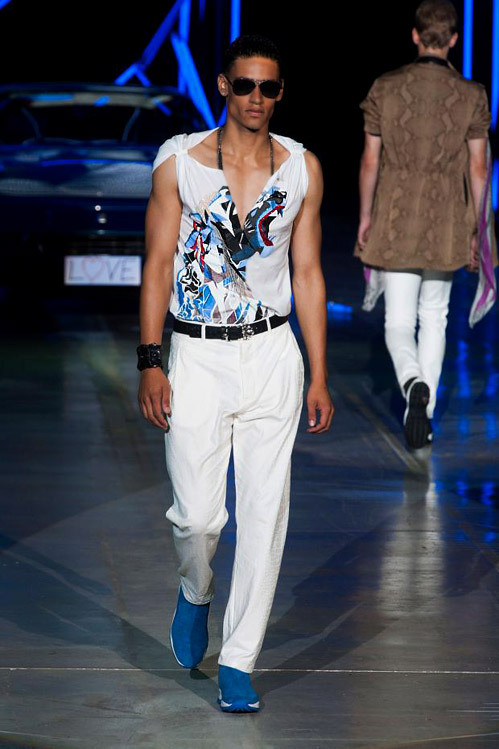 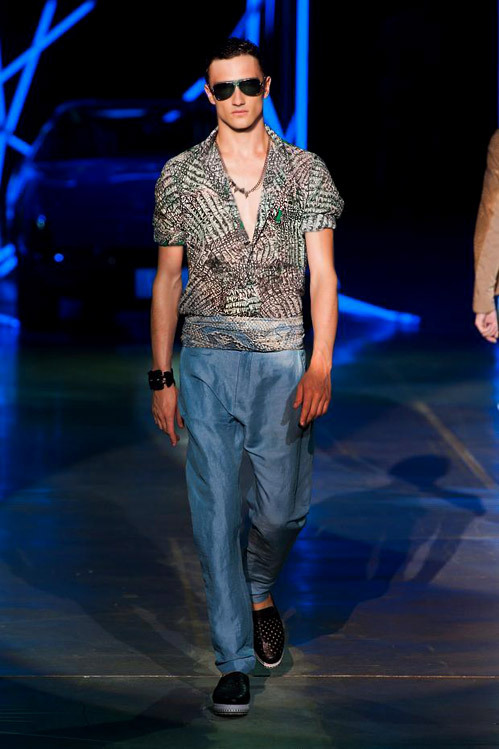 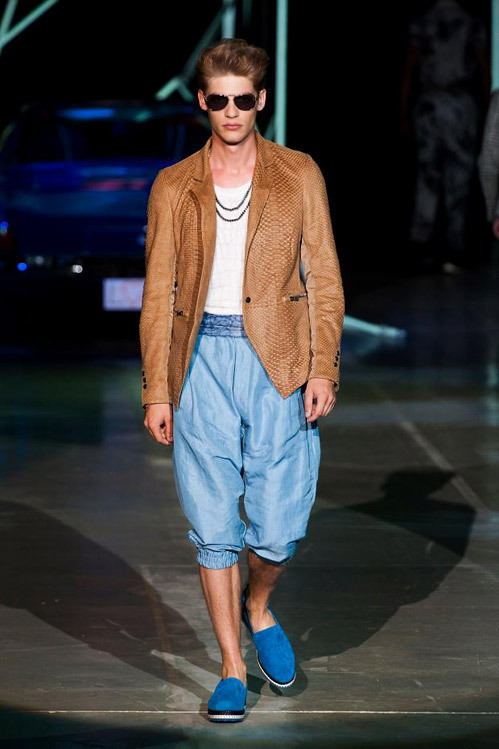 Italian designer Roberto Cavalli presented his menswear collection for the hot season of 2015 on June 24, 2014 in Italy during the Milan Fashion Week. 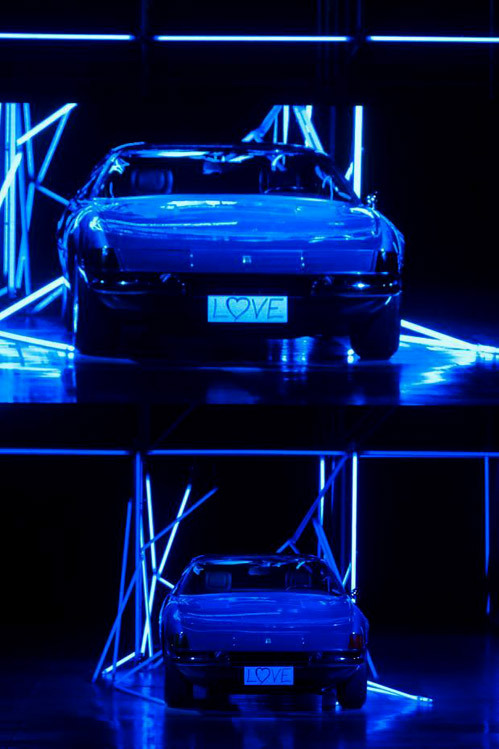 'Music has always inspired me and Aerosmith is from the 70's, like my Ferrari here', said Roberto Cavalli, who had parked his Ferrari Daytona (nearly identical to Don Johnson's 1972 sports car in Miami Vice) in the middle of the catwalk. 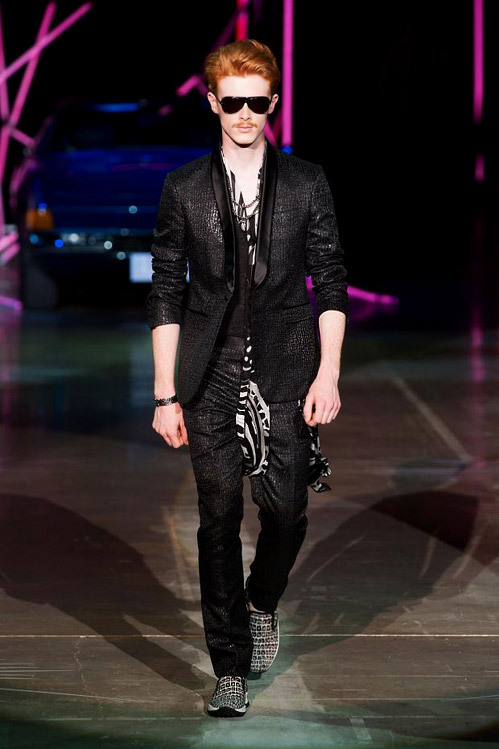 Two of the members of Aerosmith were on the front row of the show. 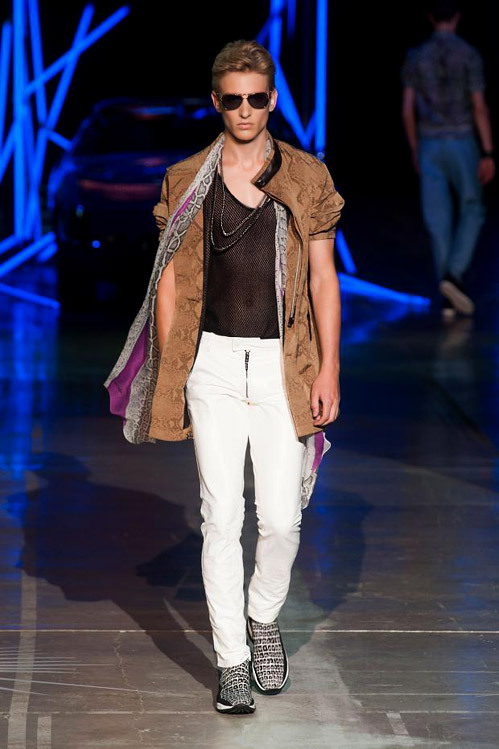 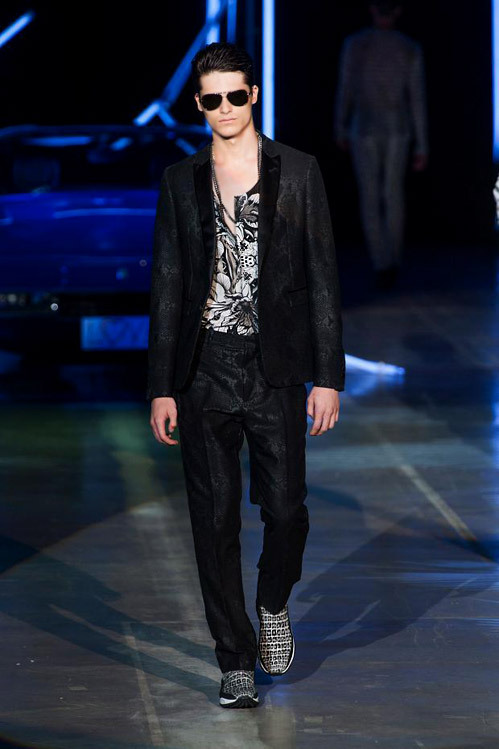 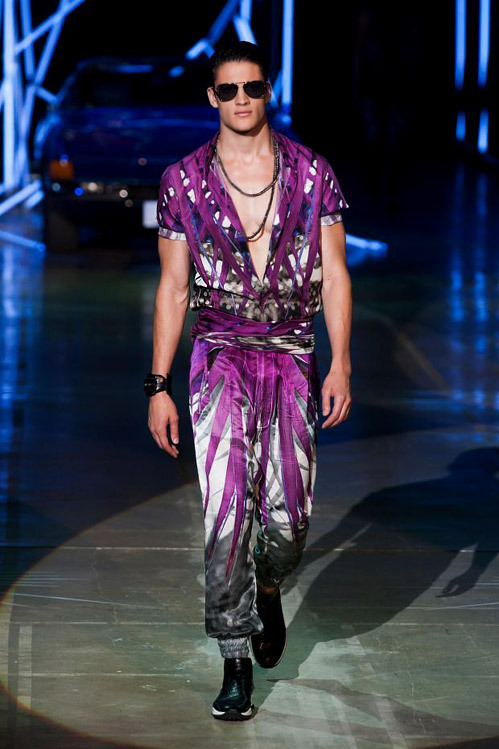 'Aerosmith's music is eternal and I hope my fashions will be eternal too' Cavalli added. 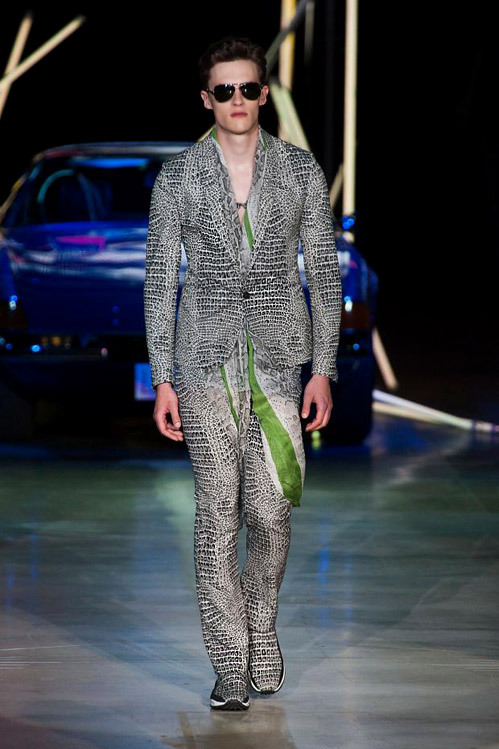 The experts defined this colorful collection as a 'marriage between cocktail attire and daywear'. 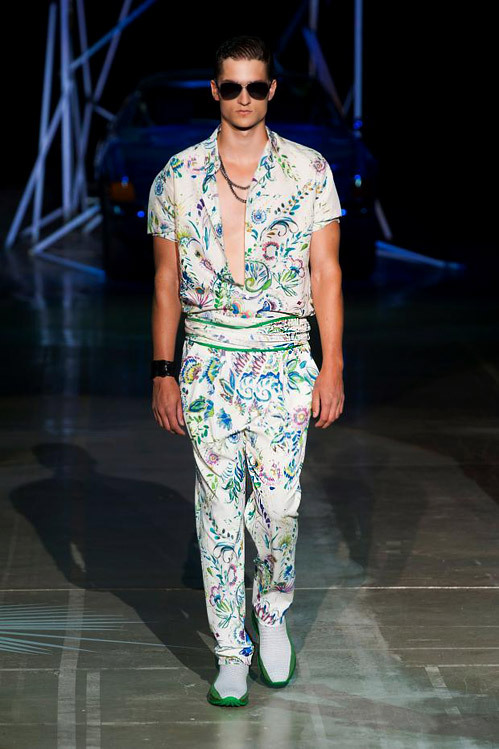 It brings the spirit of Miami in the late 1970s and early 1980s and includes: relaxed silhouettes, golden jacquard blazers, whimsical scarves, floral print karate pants, oversized obi belts, tropical print jumpers, short-sleeved shirts with plunging necklines, slim-cut pants, crafted in perforated leather sneakers, embroidered palm trees. 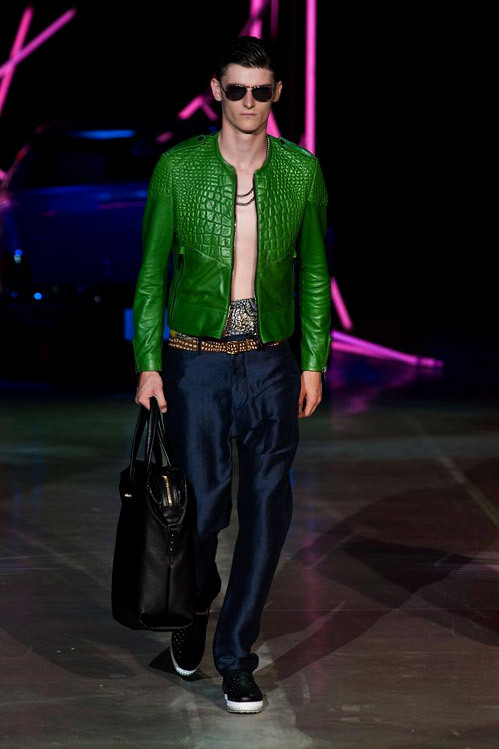 Outerwear is treated with silicone lacquer making garments feel like leather but look like cotton. 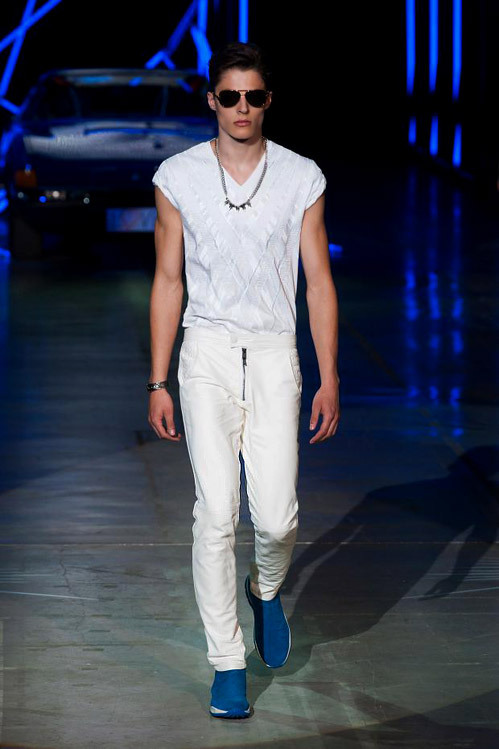 Colors are the neutral navy blue, sand, pastels and whites and the contrasting Kawasaki green, electric blue, and acid yellow.